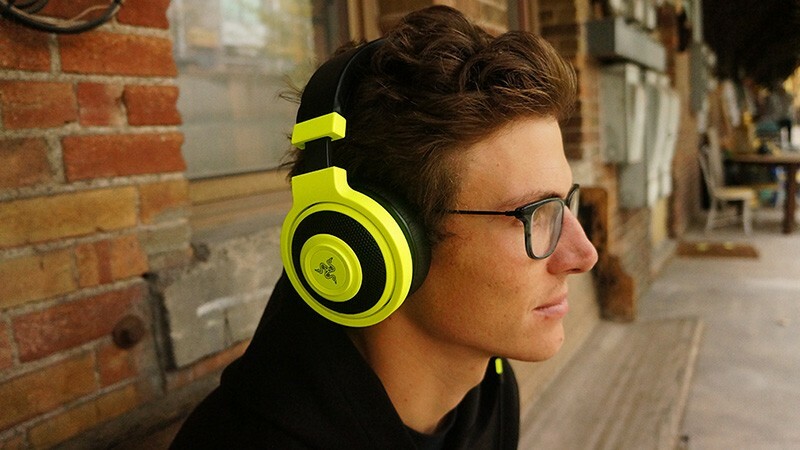 Across the globe, Razer’s line of headphones have become a must-have accessory and fashion statement among the gamer elite. Yes, that may sound like posturing, but it’s true. Almost every Let’s Player from PewDiePie down the line owns a pair of Kraken headphones, whether it be for professional use or everyday gaming. That doesn’t include the millions of regular gamers who rely on the line for their own personal use in multiplayer matches, podcasting and audio recording, and even just listening to music in their downtime. The colored cans have become an identity marker for gamers, much in the way Beats By Dre has become a go-to fashion plate for music lovers. The latest addition to the line are the Kraken Mobile series, specifically designed to work with Apple products and iOS software of almost any generation. Fresh out of the packaging I knew I was dealing with an awesome Razer product. The smell and the feel of the headphones is almost tailor-made to every gamer that ever touches them, as if 100 audiophiles jumped into the room and molded them to be lightweight, colorful and cushioned. This particular line went with a neon color scheme—we at SLUG received two pair in fluorescent yellow and hot red. These Kraken Mobile headphones stand out, and not like your normal Kraken headphones where you can see the logo from across the room—these things can be seen from down the street. 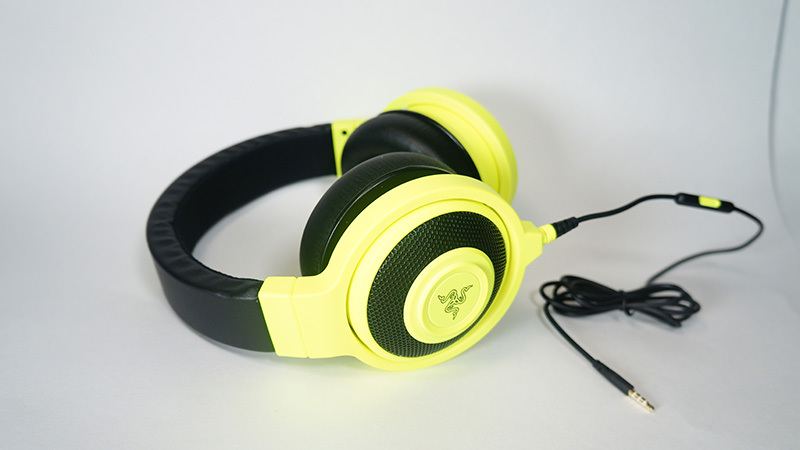 They are designed to make sure people know you’re wearing a Razer headset. I cracked open a few different games that myself and friends had available, including Fallout 4, Rise Of The Tomb Raider, Halo 5 and other random indie favorites from Steam. As far as a gaming element goes, these are fantastic—I had to adjust my volume a couple of times to account for the various levels of gameplay music and effects, but ultimately every game came through crystal clear. I even hooked the Kraken up to a USB microphone with a built-in headphone jack, and still they worked perfectly with the ability to adjust on my end for compensation. When it comes to being a gamer, this is a fine set to have that works just like any other Razer version would. The built-in microphone and media buttons were hit-or-miss. When it came to working with Siri, the program picked me up most of the time and answered my questions, but then there were times the microphone seemed to not pick up anything except a single word. It’s hard to determine at this time if the Kraken mic has some directional flaws or if Siri is just acting like Siri. Phone calls on the other hand worked great, with only a few callers telling me they noticed an echo or interference, as the mic would pick up the tone of the room or background noise. In a weird design choice, the mic is actually closer to the headset than usual, more around the neck area than the upper chest in other devices. My biggest problem came when dealing with music. Both in Apple devices and random PC towers, the bass and treble are sorely out of balance. Depending on the song you play, you’re either bombarded with bass or are forced to deal with very tinny vocals. It isn’t as bad on an iPad when viewing streaming media on Netflix and Hulu, though it has issues working with the few shows that feature HD audio. Unless you have a level meter program sitting on your desktop or some kind of sophisticated app, you’re going to notice these headphones could use an extra compressor. The Kraken was clearly designed more for gaming in mind, which is absolutely fine for gamers, but it was also built to be an on-the-go iPhone option. And of course, iTunes has ZERO solutions for helping third-party hardware work with its programming, so you’re stuck with the issue of having maybe 50 percent of your music library sound like garbage. Final verdict, the Kraken Mobile series are really cool, and for some people will be well worth the price. But it also feels like there’s a couple kinks that could have been worked out prior to launch. If you’re a true music lover who doesn’t care about using a phone for audio pleasure, that factor won’t matter to you. As far as gaming and calls go, they are a very cool option for loyal Razer users.